Renowned Kenyan media personality, Janet Mbugua opens up that negative trolls on social media actually thrust her to share her motherhood journey, publicly. Mean comments like: You look disgusting. You shouldn´t be on TV when pregnant. You are wearing a dress that is suffocating your unborn child. These were the trend on her social media pages and she decided enough is enough. Janet was an angry lioness that had been poked and decided to rise like the Queen she is. She asked one of her critics: So what about being pregnant? How did you come into the world? Don´t you know you are insulting your mum? Instead of backlash from fans, they actually turned the tables and applauded the TV siren who then bounced back and shared her motherhood journey. This journey was shared to a myriad of women from across her social media platform and hasn´t looked back ever since. However, this that was just but the tip of an iceberg when it came to negative trolls. She returns to work after giving birth and her boss gives them a stern warning about getting pregnant. Janet Mbugua recalls several incidences where her boss would be so mean, always jeering at women but she could not stand it. This is how the endometriosis warrior is now involved in couple of initiatives that stand up for women, even for their maternal health. 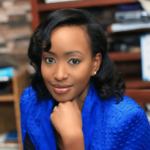 The post Renowned Journalist, Janet Mbugua opens up on what actually pushed her to share her motherhood journey appeared first on Ghafla! Kenya.